Have you experienced craving for something but not really too sure what you want yet at the same time? 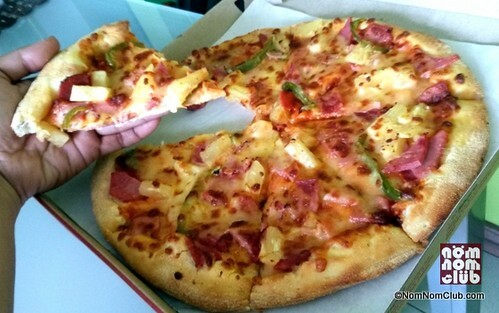 It’s the craving we had over last Saturday, and a pleasant surprise came over courtesy of the Greenwich Barkada! Greenwhich favorites Hawaiian Overload Pizza and Creamy Carbonara Pasta was our company for lunch after waking up late last Saturday. It came at a perfect time before we headed for SM Mall of Asia to catch the second week of 2014 Pyromusical that night. The Greenwich Hawaiian Overload Pizza is now made better with more cheddar, mozzarella, meat,, pineapples and topped off with bell peppers. Although I’m more of lasagna fan, I think the Creamy Carbonara Pasta would be a good alternative. 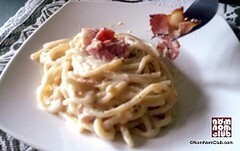 The visually creamy sauce and crispy bacon bits with grated parmesan cheese on top looks really appealing; and savory too! So if I’ve made you hungry enough with this post and the photos, you can also order your own Hawaiian Overload Pizza and Creamy Carbonara Pasta from Greenwich Pizza delivery at 5-5-5-5-5 (Metro Manila), 435-5555 (Cavite), and 254-1000 (Cebu). You can also check their website at greenwich.com.ph. How much is the carbonara of Greenwich?